It seems these days that the world is full of psychedelically-oriented guitar bands, and just like any genre that is overexposed, it is sometimes difficult to sort the wheat from the chaff. Well, i listen to lots of this stuff, from shoegaze to post-rock to straight up psychedelia, and i am here to tell you this: Leaves Leader by Grimble Grumble is the best album in this genre since Mogwai's Young Team. No, seriously: this elusive Chicago-based band have released a masterpiece in the genre of noisy, wandering, guitar music. I have been following this band off and on since the late 90s. According to The All Music Guide, they have been around since 1996 and have released 2 other albums and 2 EPs since then. 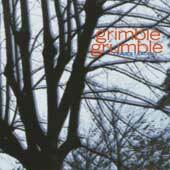 I have both of the EPs listed, but this is the first Grimble Grumble album i have ever seen. So, their music isn't exactly easy to find.... However, you should definitely take the effort to try and track down their releases. This is some thick, sludgy, distortion-heavy music. It's beautiful in parts, and dark and meandering in others. It's trippy, in that, if you just sit and listen to it, your mind will wander to unexpected directions. Yet Grimble Grumble still manages to keep it both catchy and interesting, with hummable melodies and driving rhythms. I cannot recommend Leaves Leader enough. Seriously. Stop reading this and go out and try to find a copy. Okay, enough of that, let's talk in detail about the actual album. It's short, clocking in at just under 40 minutes, but Grimble Grumble pack a heck of a lot into that time frame. The album starts off with a brief (40 second) untitled interlude of ambient noise -- i think it's the sound of bugs chirping away in a forest somewhere, although they are recorded rather loud. After the bugs fade out, a chiming guitar meanders in, saunters around for a bit, and eventually is joined by another, then the bass and drums kick in and Rail Road moves along under a thick groove of jazzy drumming and echoed female vocals. It builds to a frenzy, then drops off rather suddenly. It is replaced by Casanova, in which the guitars echo and burn in a distorted bluesy mess. Simply wonderful guitarwork, everything that psychedelia could be. In fact, this song in particular does what Bardo Pond used to do before they got sidetracked into stoner prog blues. In fact, Casanova fulfills the promise of Bardo Pond -- highly distorted, well-played guitars backed by strong rhythms and a delicate female voice -- without succumbing to unnecessary guitar histrionics. Again, the tune builds to a frenzy before fading out. The next song, Wish Song, starts with a syncopated drum riff and the two guitars chiming away lightly. The syncopation grows, until the entire band is playing one long series of staccato riffs with various instruments taking a brief solo over the grinding noise. It's impressive in its monotony -- the driving staccato rhythm just keeps building and building, growing slightly louder for a few minutes, until the sheer power of it seems unstoppable. Then, Grimble Grumble just let it suddenly stop and fade back into the guitar haze, as if they couldn’t keep up the rhythm any longer, and they just have to fade back into noodling around with their instruments. In fact, the noodling is a relief after the massive tension that the staccato riffing builds. It's a really beautiful and powerful moment, and this song is simply stunning. After that there is a short, synthesizery keyboard interlude at the start of Third Song, then the guitars chime in. This song builds ever so slowly, the female voice barely whispering along, then suddenly it explodes into some intense rocking action. The drummer is going crazy on his kit and the guitars are whirling away under an impressive weight of echo. The next tune, Intro is dubbier than those which came before. The drums here are echoed nicely, and they combine to good effect with an echoed guitar line. This is a short piece, and the echo builds and builds until it suddenly fades into the acoustic guitar driven Fall. Only one of the guitars is an acoustic here, strumming along like something off of Led Zeppelin III, while the other one is echoed, chorused, and distorted. The acoustic gives this song a very old, 70s sort of psychedelic feel to it. Finally, Grimble Grumble leave us with Emma Sleeping Blues. This song is slower than the rest, starting with a really slow burn in built of light guitarwork. This one meanders along slowly, never building to the frenzy that much of the rest of the album does. Still, it's nice. This is simply a stunning album. I have already urged you to go and track down a copy, so get to it. You need to hear this.